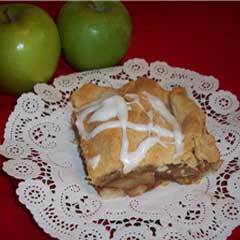 These apple slices would be great take to work, a luncheon or for a family dessert. They have great flavor. For those of you who love apples this is for you! Sift flour and salt, cut in shortening. Beat egg yolks slightly. Add egg yolks, water and lemon juice, into flour and shortening, mix to a soft dough. Mix sliced apples, sugar, cinnamon and nutmeg, set aside. Take half of the dough and roll it out. Place in the bottom of a rectangular 9” x 12” pan. Arrange the apple slices on top of the dough. Roll out the remaining half of the dough and place on top of the apples. Bake at 400 degrees for 1 hour. When apple slices are cooled drizzle with a powdered sugar glaze (1 cup powdered sugar, 3 tsp milk or water, mix until smooth).